Eric earned his J.D. from the J. Reuben Clark Law School at Brigham Young University in 1978 representing the law school in both Mock Trial and Moot Court competitions. Prior to this distinction, Eric attended Arizona State University and Brigham Young University and earned his undergraduate degree in communication, with an emphasis in journalism. Eric is a member of the State Bars of Arizona and Utah. Eric is a member of the State Bar Construction Law section, and the Probate and Trust sections. 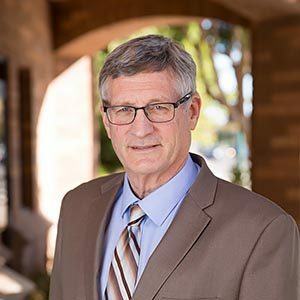 He is the past president of the Mesa Rotary Club, former chairman of the Mesa Chamber of Commerce, former chairman for the 2005 Mesa Citizens Bond Committee. He is an active board member of WESTMARC. Eric and his wife Saurell have six children and 18 grandchildren. He enjoys theater, music, sports, hiking, and travel.